Our last blog looked at the Queensland government’s targets to reduce waste and their recognition of the universal trend towards recycling. Australians are now committing to high levels of recycling. When people understand how much energy can be saved through their recycling efforts and the positive impacts upon the environment, it creates an even stronger motivation to recycle. Glass is 100% recyclable, able to be recycled over and over, indefinitely, even millions of times. 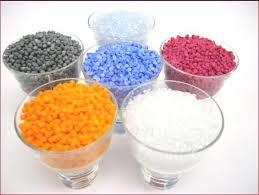 Making glass products with recycled glass saves 30% of energy. Refillable glass bottles save more energy than throwaway bottles, using only 19,000 BTUs of energy, compared to 38,000 BTUs. One recycled glass bottle will save enough energy to power four hours of a 100 watt electric light bulb. Aluminium cans will save a massive 95% of energy when recycled to make more aluminium cans, cars and aeroplanes. Recycling just one aluminium can will save enough energy to power your TV for three hours or a 100 watt light bulb for 3.5 hours. Kartaway Queensland support these recycling efforts, providing bins and skips in Brisbane as well as skips and bins in the Gold Coast and the Sunshine Coast to corporates and the public. They recycle wherever possible and look forward to the new opportunities to recycle and recover a greater percentage of waste as the new strategy rolls out. Kartaway welcomes the Queensland Government’s waste strategy targets to reduce waste going to landfill by 25% this year, representing 4.6 million tonnes, and 50% by 2020, representing 16.3million tonnes. Kartaway are leaders in recycling and waste management and support the Government’s targets for increasing the recycling of household waste to 84 kg per person per year in 2014 and 150 Kg per person per year by 2020. Recognising that there is a trend towards recycling and resource recovery world-wide and unprecedented growth in the industry and that Queensland has been missing the opportunity to benefit financially from this emerging industry, a strategy has been developed to provide vision and drive reform. Queensland’s outdated waste management framework has had investors looking to other states to invest in their recycling and recovery programs. Apart from the financial benefits to the state, environmental and social factors have also been considered. Potential leachate, odour and greenhouse gas emission impacts from landfill are major environmental concerns. As more waste is created and disposed of in landfill areas, more land is required for landfill. Finding suitable sites that don’t impact on nearby land uses, such as residential areas, becomes more difficult and expensive, leading to higher costs to ratepayers. The goal is to move to a more cyclical system where resources are recovered and recycled again and again, making better use of finite resources. Kartaway Queensland recycle wherever possible, and embrace the new opportunities to recycle and recover a greater percentage of waste collected that this strategy will bring about. When you hire a skip or bin for building, renovations or rebuilding most building materials you put into the bin or skip can be recycled. Recycling concrete has many benefits. For example, it saves on landfill, when used for gravel reduces gravel mining, reduces pollution when used as the base material for roadways, one ton of recycled cement saves 1,360 gallons of water and 900 kg of co2, and recycling keeps construction costs down. Concrete is crushed in crushing machines at a specialist facility. These facilities accept only uncontaminated concrete, so trash, wood, paper and similar materials must be removed. Metals can be removed at the facility with magnets and are then melted down for recycling elsewhere. Once crushed other particulates are filtered out and these fines and aggregates are sold to local councils, government departments, builders, plumbers, civil contractors and landscapers for use within the building and construction industry. Bricks can simply be cleaned then re-used for buildings or projects, such as landscaping and wall construction. Alternatively, they can be recycled for landscape material when crushed into brick chips. When crushed into finer particles they can be used in manufacturing road-base, track and drainage material, fill sand or even to make new bricks. Recycling Depots will inevitably receive large amounts of soil with many truck loads of waste, particularly from building sites or landscapers, as soil is picked up along with the waste when it is loaded. This soil is put through several screens to produce a finer product that can be re-used. Gyprock or Plaster boards can be recycled. The board is separated to create a gypsum powder, and can be achieved quite efficiently where high quantities are available. This plaster powder is nearly as good as the virgin quality. Kartaway Queensland has been helping out some interesting customers lately. BSC Airport Systems for example who are carrying out works at the Brisbane International Airport, where old aerobridges are being removed and new ones are being installed on the tarmac. The 12m3 bin supplied will store all the construction and demolition waste during the operations, then be picked up by Kartaway once the job is completed or the bin full. It is anticipated that the works will not be lengthy. Another customer, Multi Span are constructing a two storey industrial building for storage and distribution of recycled goods at Polytrade Recycling. 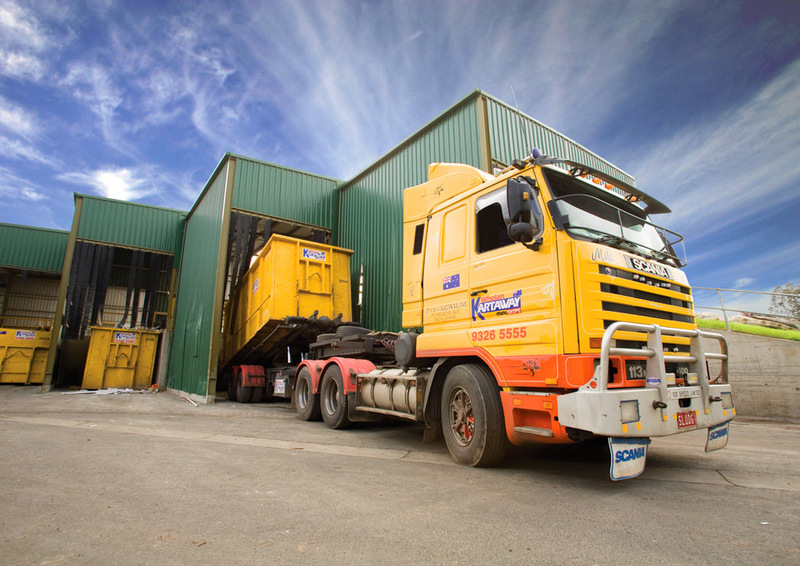 Kartaway have supplied a 6m3 bin for the construction material waste created during the building process. Clients and needs vary greatly, as is evident by this mix. Kartaway are supplying a 6m3 bin during the refurbishment of the Foley Building including 6 multi purpose classrooms and art & science classrooms for Brigidine College at Indooroopilly– a part of the Queensland Government’s Flying Start Capital Assistance Scheme to develop facilities for Year 7 students across Queensland. The build is being undertaken by client Kenbar Construction. And to top it all off – a 12m3 bin for client Quadric who are demolishing and refurbishing the Boondall Police Station. Clients appreciate the level of service – deliveries and picks ups to suit their schedules, helpful advice on the best waste removal option and an Account Manager on call for account clients. Kartaway Queensland would like to thank all their clients and customers for their support during 2013 and wish everyone a very happy festive season. Further to a recent blog about the concern the industry associations have regarding the recent removal of tyre storage from Queensland’s Department of Environment Environmentally Relevant Activities (ERAs) in the Environmental Protection Regulation, another fire caused by tyre stockpiling broke out in Western Sydney four weeks ago. The Sydney Morning Herald reported on November 18th that this fire is linked to an accused murderer, Ron Medich. He is a part owner of Carbon Polymers, the company that had stockpiled the tyres. The fire almost gutted a tyre dump in Smithfield and the company has now been expelled from the site. In New South Wales alone there have been 256 blazes over the past five years caused by tyres. Unfortunately, a criminal element has crept into the tyre disposal market. Offering a cheap rate to dispose of tyres, the unsuspecting customer is told the tyres are being stored temporarily. The reality is the used tyres are stored in facilities that are not purpose built to offset the risk of long lasting “oil fires” generated by waste tyres and the tyres are stockpiled. Grant Musgrove, CEO of the Australian Council of Recycling, has warned of this criminal element and recent disclosures by the Sydney Morning Herald are disturbing. When disposing of tyres customers should be asking how and where the tyres are being disposed of. Using a reputable company to organise the recycling of tyres is recommended. Kartaway Queensland are a leading waste management company and will collect used tyres, ensuring that the tyres are then sent to bona fide recyclers. Customers can then rest assured that the disposal of their tyres has not had a negative impact on the environment or to human health. Grant Musgove has warned the Department of the Environment that fires caused by tyres have a high environmental and health cost, affecting waterways, soil and the air. The Remanufacturing Award was won by Kennedy’s Timbers, based at Narangba. The award recognises outstanding processes and/or leadership in the utilisation of secondary-resource recovery and market development within Queensland. Nominees covered the development of new markets for secondary resources through to exceptional recovery of particular material streams. Kennedy’s recycle timbers from power poles to bridges, drawing from a range of industry sectors. They remanufacture timber products including flooring and work benches. Some of their projects have included timber cladding to the Suncorp Stadium, all 48.5km of it, and the iconic Tree of Knowledge at Barcaldine. 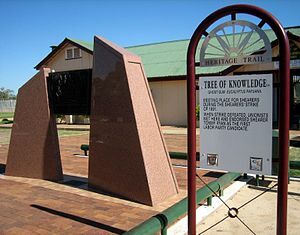 The Tree of Knowledge is a monument to the Shearer’s Strike of 1891, centred around a ghost gum in the main street of Barcaldine where the leaders held their meetings. This unrest and strike lead to the formation of the Labor Party. 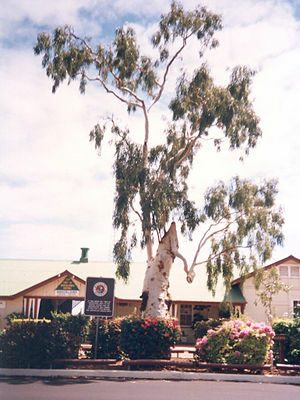 The ghost gum no longer survives, having been poisoned in 2006; the new memorial on the site of the original tree was opened in 2009. The Innovation Award was won by a partnership program by Groundworks and NuGrow for the waste recycling to green infrastructure innovation. The model they created converts liquid waste and green waste into a high grade organics product. This forms the basis of the proprietary Ecoblanket process which achieves rapid, sustainable vegatation. Legacy Way in Brisbane used this process resulting in impressive revegation of native species to stablise sloped areas and manage erosion. Kartaway Queensland commend the WRIQ for highlighting outstanding achievements in reducing waste to the waste stream and congratulate the category winners. Information obtained from WRIQ Newsletter edition 2 October 2013. Queensland has over 430 landfills and transfer stations servicing 4.6 million people in 73 local government areas, that’s about six facilities per local government. And here’s the rub, due to a high variation in population across these areas some of the remote and rural areas have as many as 14 facilities to service no more than 33,000 residents! Not only is this unsustainable, but only commercial customers are charged gate fees whilst domestic users are charged nothing at the gate to dispose of rubbish. So the cost is borne by businesses or covered under utility charges imposed by councils to raise revenue to operate the facilities. There are economic opportunities in recycling waste and secondary recovery of waste but the state stands no chance of capturing them until a generational change occurs. The Department of Environment and Heritage Protection (EHP) has stated that it will be consistent in taking prompt, strong enforcement action to ensure waste facility owners act responsibly and meet their environmental obligations. There is an expectation that all waste facility holders will be subject to the same standards and those that do not meet minimum environmental standards will no longer be permitted to operate or will be required to invest in significant resources to being them up to scratch. Thus councils with a high proportion of waste facilities will be forced to review their current landfills and transfer stations. This will limit the long term environmental and economic liability on ratepayers and provide the state with a more efficient and sustainable waste management system, one focused on resource recovery and environmental protection. Kartaway are able to operate public recycling centres in other states that recycle most waste collected and have green star certification. Many local governments have already begun to rationalise their landfills, with Mackay and the Gold Coast leading the way. This provides the seeds of change but is just the tip of what is required for generational change. The Waste Recycling Industry Association (Qld) believes a rationalisation of up to 65% of landfills in Queensland is required over the next few years, concentrating on lifting all environmental standards and closing waste facilities that do not meet minimum engineered and managed performance criteria.